These systems provide cold water for hot weather conditions in the concrete production industry. Units can be portable or stationary with various capacities for any size operation. An excellent alternative to using ice to cool concrete, water chillers can reduce chilling costs as much as 95%. Air Cooled Water Chillers also allow for precise control of temperature and ensure consistent concrete temperature and quality. State of the art technology reduces downtime and diagnostic controls make it easy and fast to identify and resolve problems locally or remotely. Coils on the water chillers provide protection in adverse environments. Factory trained technician can provide start up on each chiller to ensure proper operation at the jobsite upon request. These chillers are easy to unload and install. No time consuming field install required saving time and money. Robust design is quieter and more durable than others in the market. Achieve maximum performance and reliability with an air-cooled water chiller system with Carrier name brand you can trust. Produce concrete at a precise temperature under a wide variety of conditions. Lower cost versus ice or other alternatives. Lower risk of rejected or defective concrete. * Based on a 35° F (19.4° C) temperature drop, a 75° F (24° C) inlet, and a 40° F (4.4° C) outlet temperature. Lowest output temperature on standard air cooled water chiller units is 40° F (4.4° C). 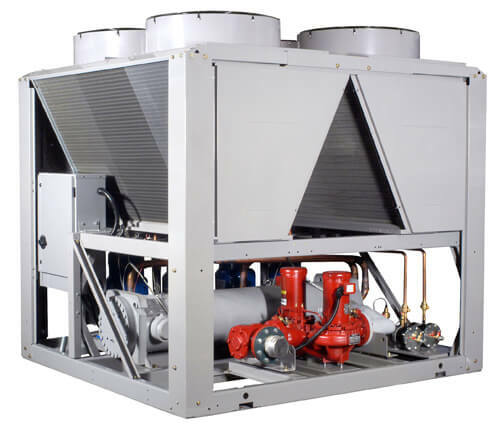 Custom units are available to achieve a lower temperature. These lines of gas snow throwers use Troy-Bilt or Briggs & Stratton engines and have electric start and mitten grip manual recoil starter. Clearing width from 21” to 45” with 2 year limited warranty. Portable insulated curtains are great for warehouses, unloading docks, food processing plants, restaurants or anywhere that you may need an isolation climate control space but don't need construction mess.